Position your company among the industry leaders. Reach thousands of upstream energy professionals at oil and gas events, online, and in print publications. In the last five years, SPE has funded USD 20 million in grants and scholarships, and has supported 162+ distinguished lecturers who traveled to 100+ countries providing in-person educational talks for energy professionals. Engage with E&P leaders face to face at 100+ premiere SPE events around the globe and show case your technologies, products, and services to the oil and gas industry top decision makers. With exclusive customized and upgraded packages, we can help you boost your brand recognition and exceed your business goals. Maximize your exposure to E&P business decision makers and gain new business leads. Advertise with SPE online, in eNewsletters, and with Expert Hour Webinars. Now offering premium online advertising! 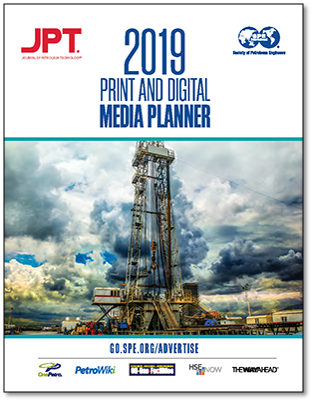 For immediate access to the Print and Digital media planner, including pricing, please provide your contact information to download the brochure. By downloading the media kit, you are opting in to receive monthly SPE sales communications. You can unsubscribe from these promotional emails at any time.